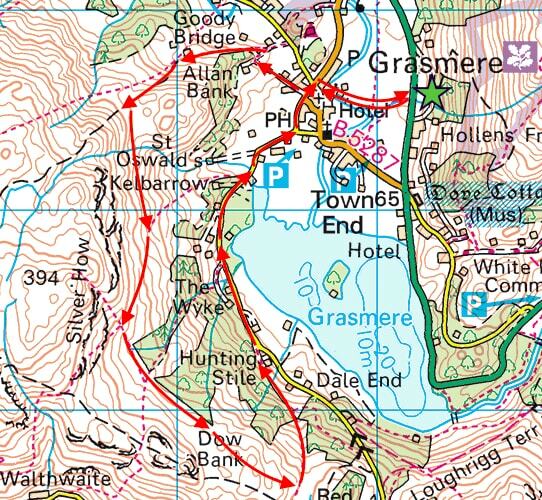 We were in Grasmere today but didn’t really have a firm plan as regards a walk as the forecast seemed to indicate that things were likely to be changeable, well, they got that one spot on. 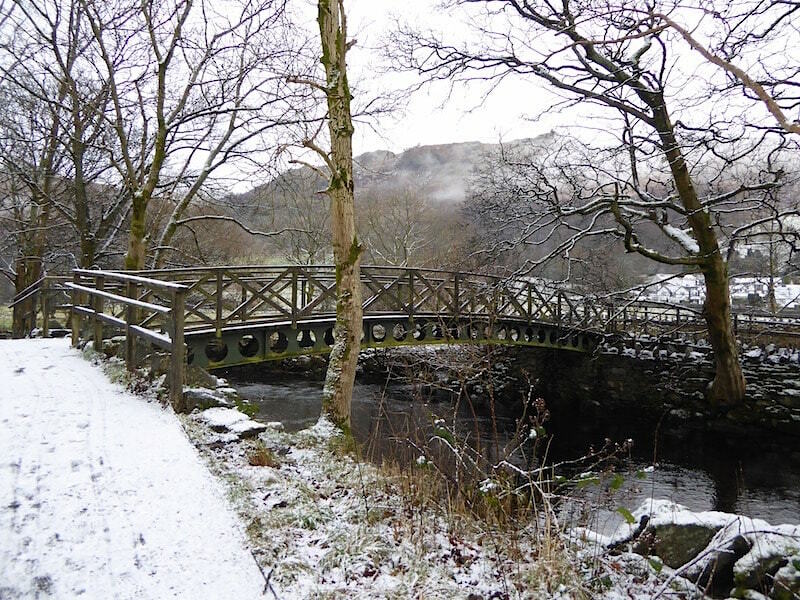 After slithering and sliding around the very icy and slippery village streets we set off up Allan Bank under heavy grey skies in bitterly cold conditions. 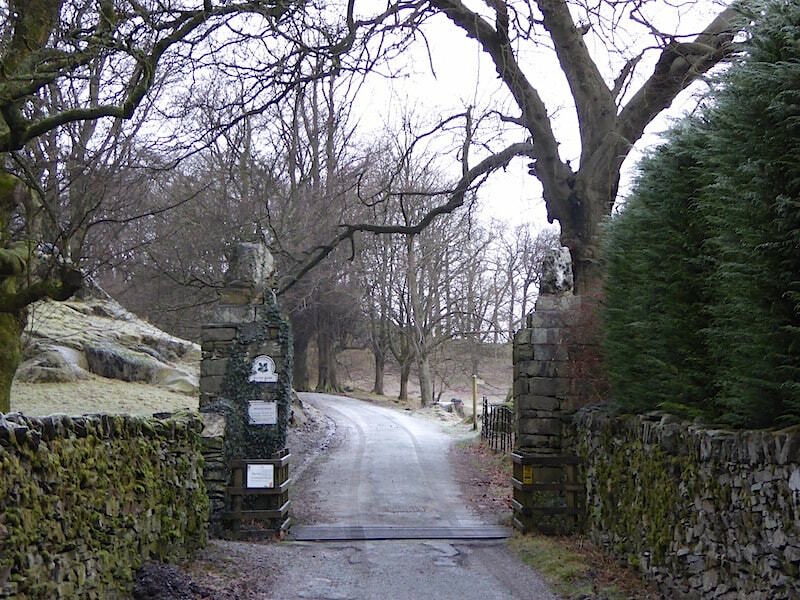 The road surface along to Allan Bank was very slippery underfoot but we carried on having decided that we would simply see how things developed. 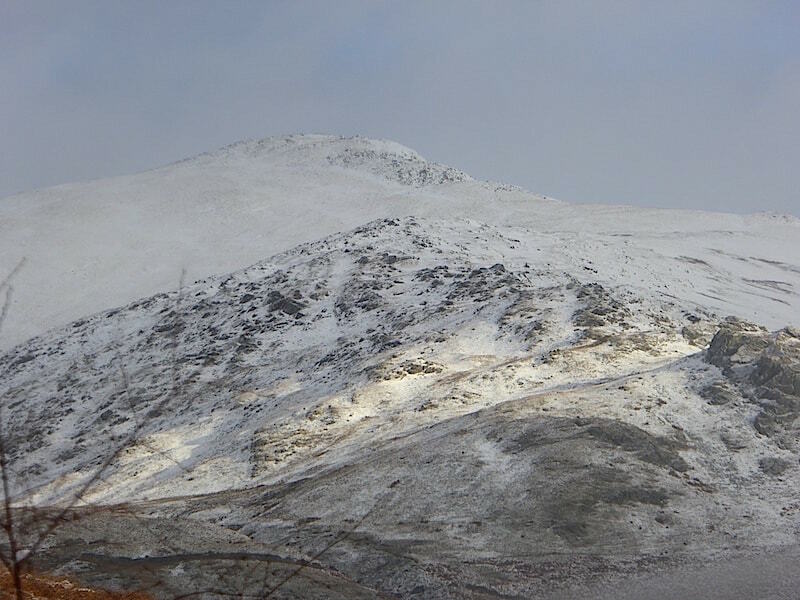 A look back at Seat Sandal as we walk up Allan Bank. 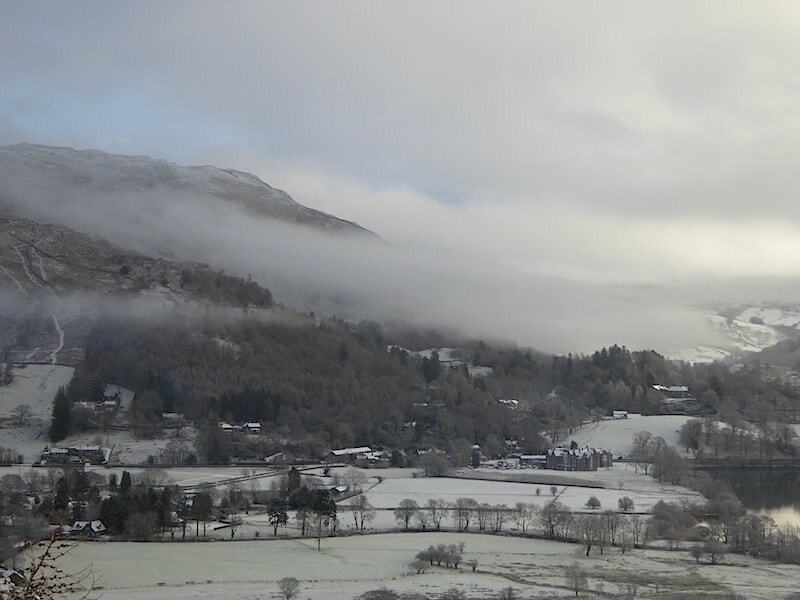 Also from Allan Bank a view of Helm Crag. 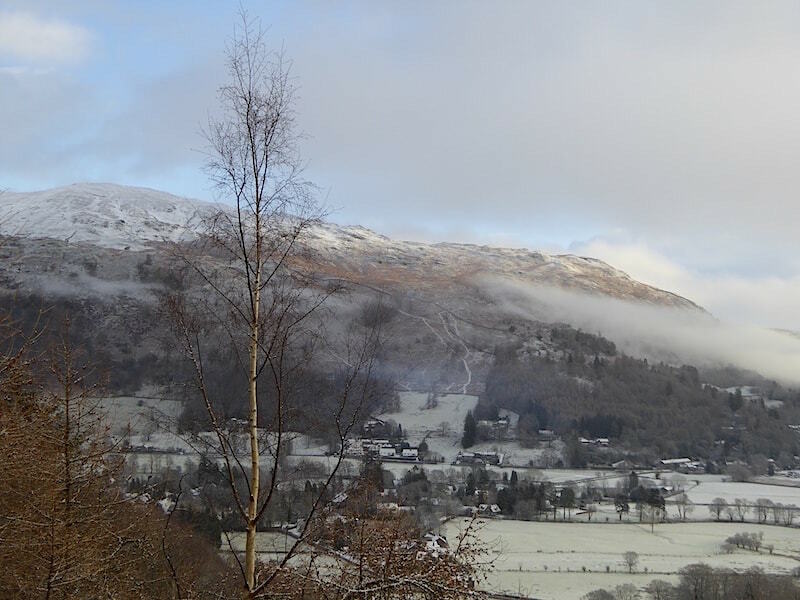 A close up of Stone Arthur …..
….. and a longer view of it looking across Grasmere village. We continued along the Silver How path but it soon became clear that our progress upwards would inevitably come to a halt. The ground was extremely icy and we hadn’t got our spikes with us so progress was slow as we tried to find non-slip footholds, added to which we were suddenly enveloped in a snow storm which arrived from nowhere without any warning. 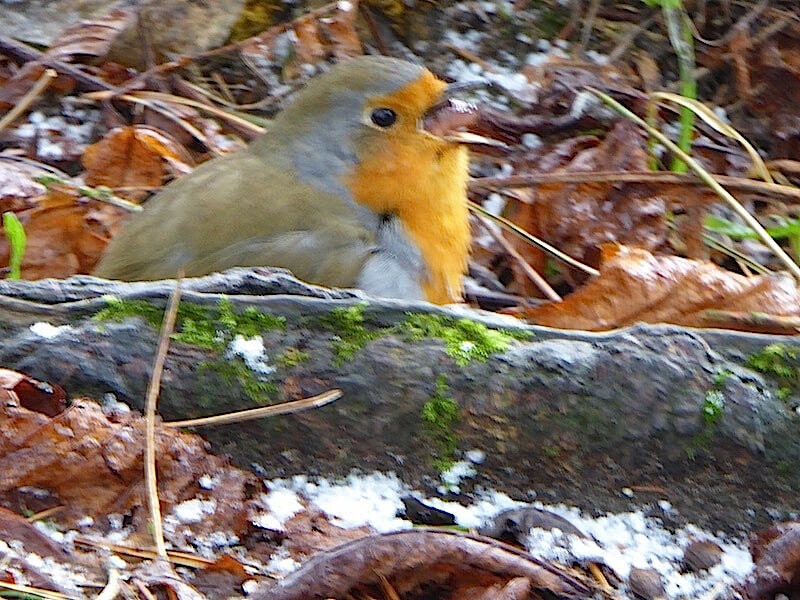 The flakes were the size of 50p coins and we could barely see anything around us. After waiting around for a while it showed no sign of stopping so we abandoned any hope of going further up and continued with our walk using the paths on the lower slopes instead. 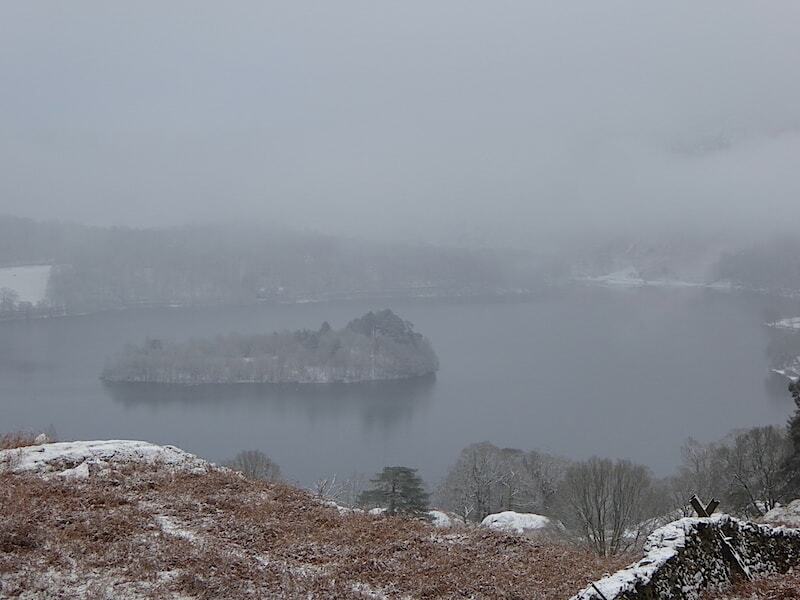 The snow storm abated eventually but was followed by some very strange weather happenings which we may well have missed if we had continued up Silver How. 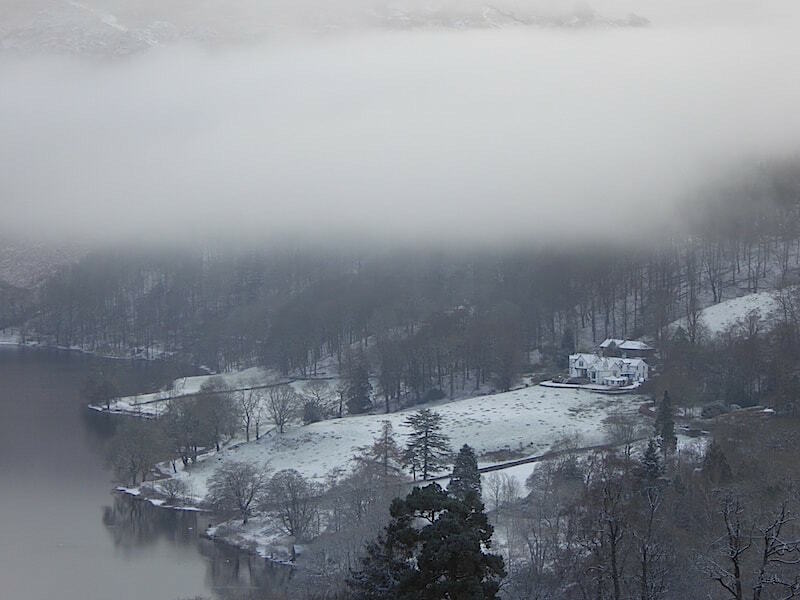 Here we’re looking across a very misty Grasmere after the snow storm had moved away. Slowly the fog became thicker and thicker …..
….. until it obliterated everything almost down to ground level. 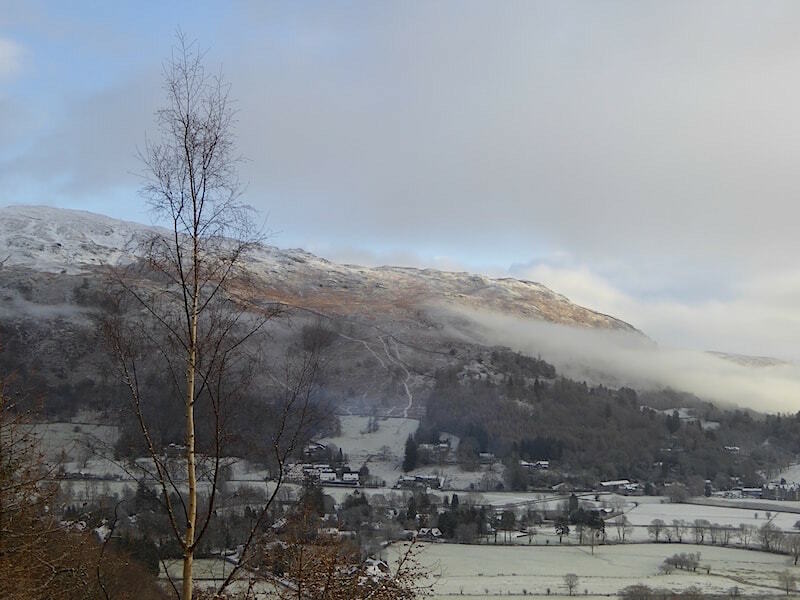 As quickly as it came the fog lifted again. 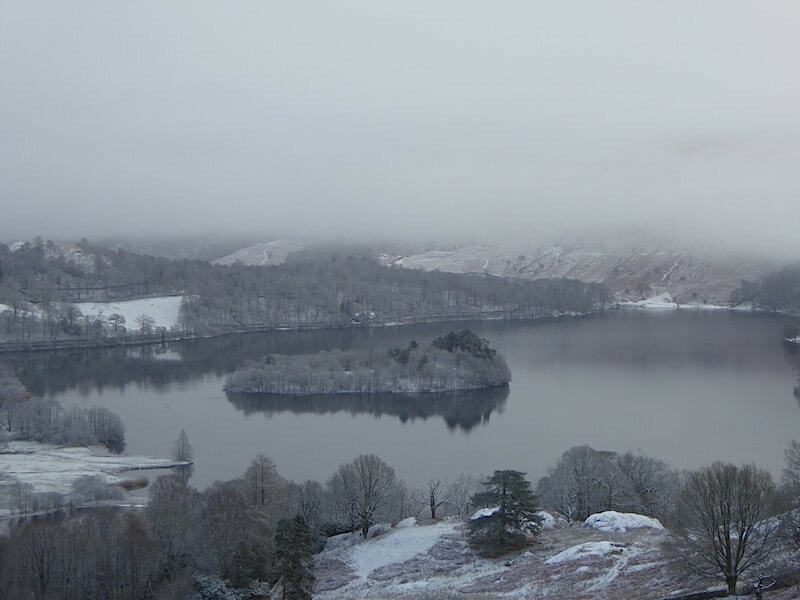 Grasmere becomes visible again …..
….. but no sign of Loughrigg which is somewhere in all of that. 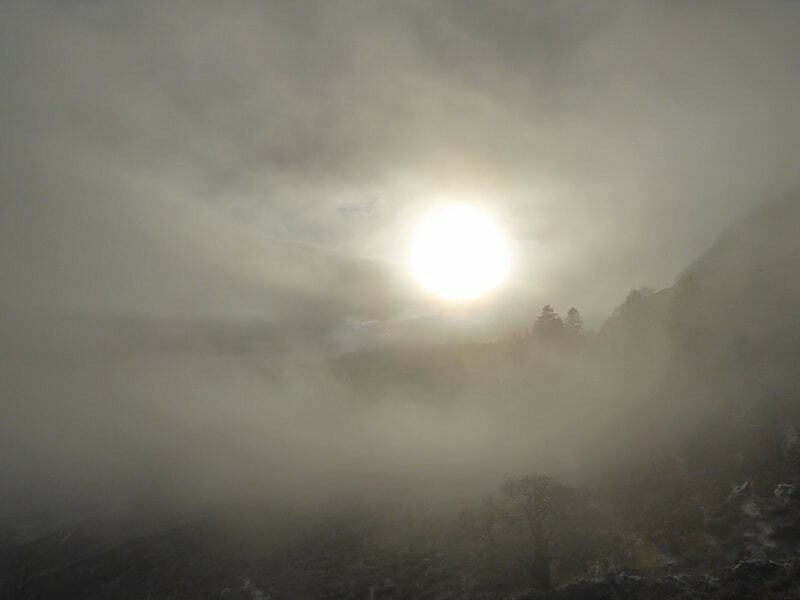 The sun was doing its best to break through the murk. Hello what’s this, is the cloud about to break up? Alas, no it wasn’t and gloom descended again. Across from us Nab Scar manages to grab a bit of sunshine. 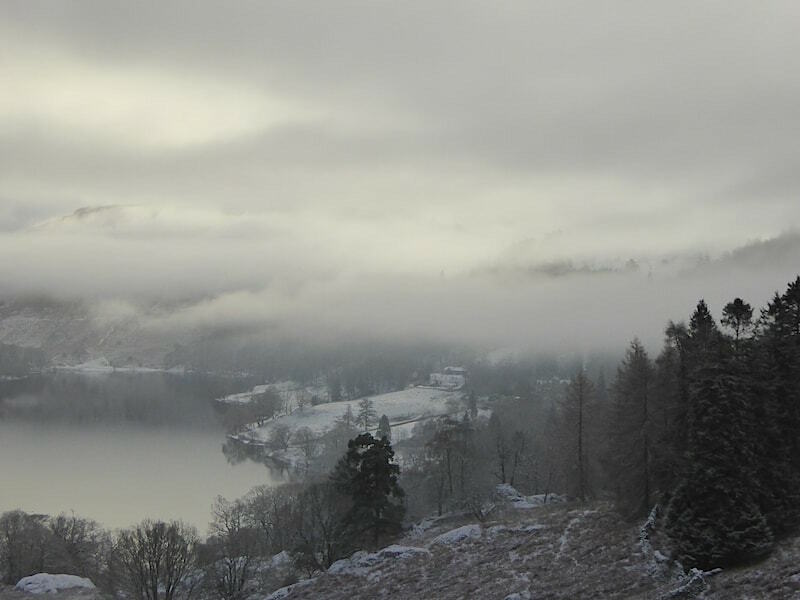 Loughrigg is about to break free from the fog. 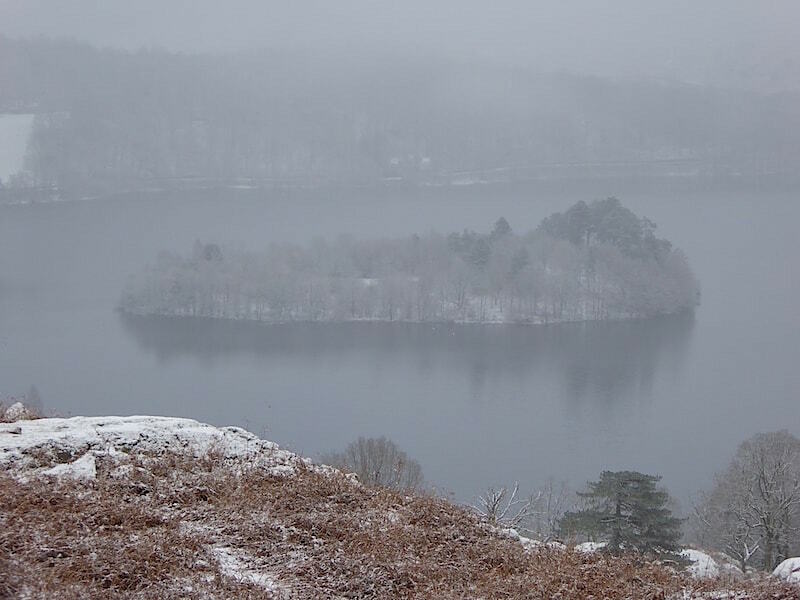 By the way, this isn’t a black and white photo, the scene before us was as monochrome as it looks. 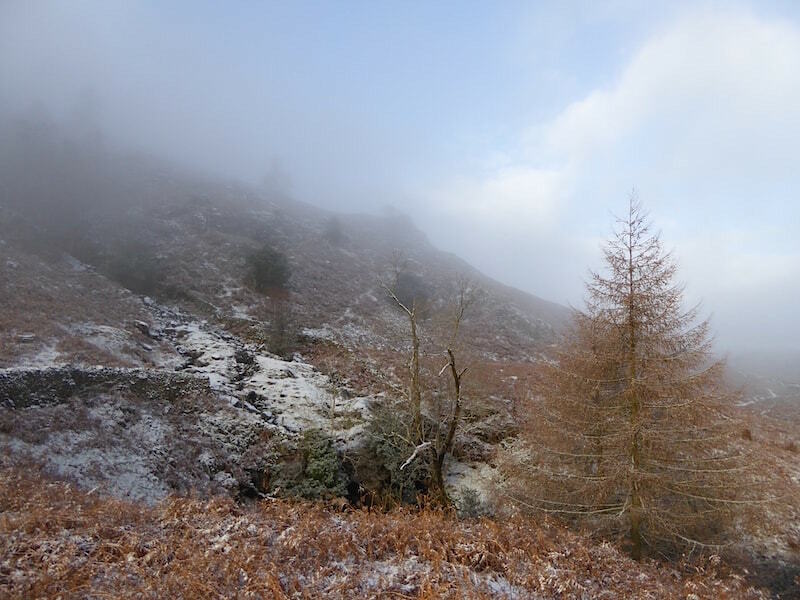 The misty light was quite weird at times. 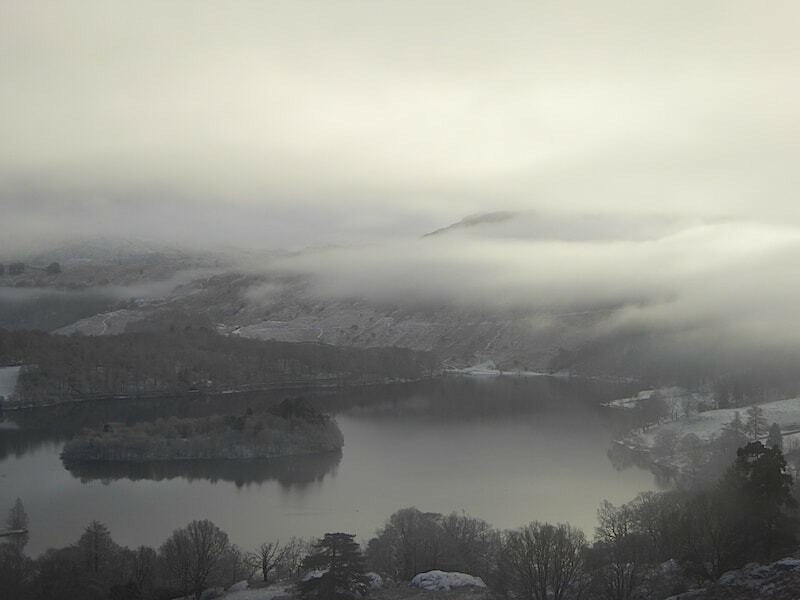 Grasmere looking quite surreal with all this fog coming and going. 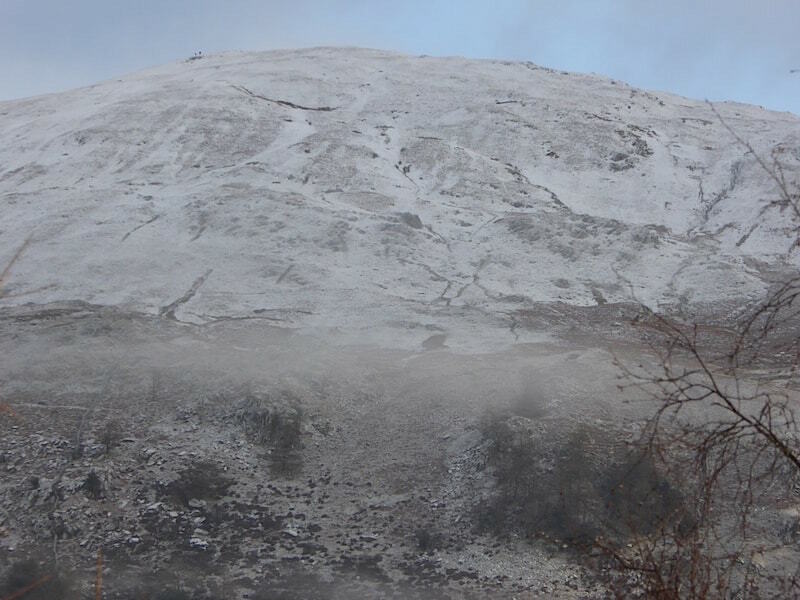 The fog is now rising up the slopes towards the top of Silver How. Perhaps its just as well we didn’t get up there, we’d probably be in the cloud with no views at all. At least down here we can watch the magic of nature. 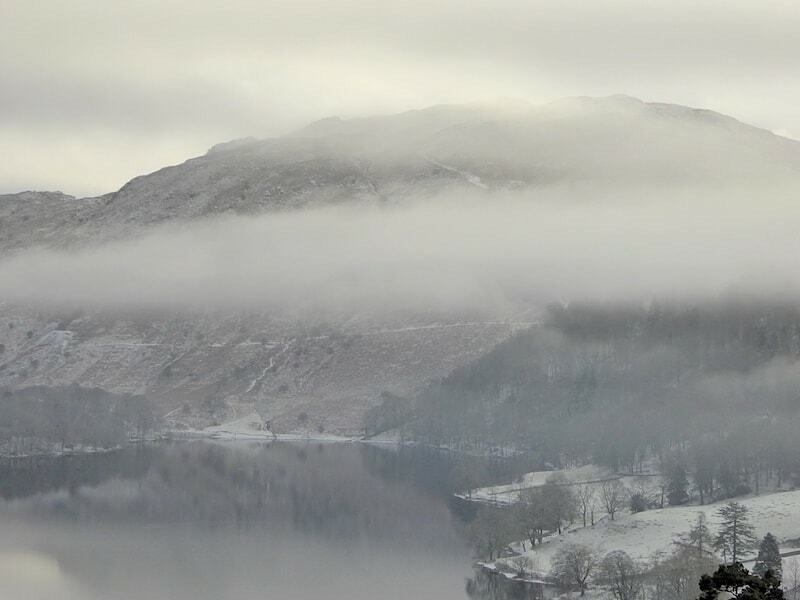 On the other side of the lake the fog is now starting to creep up Nab Scar. 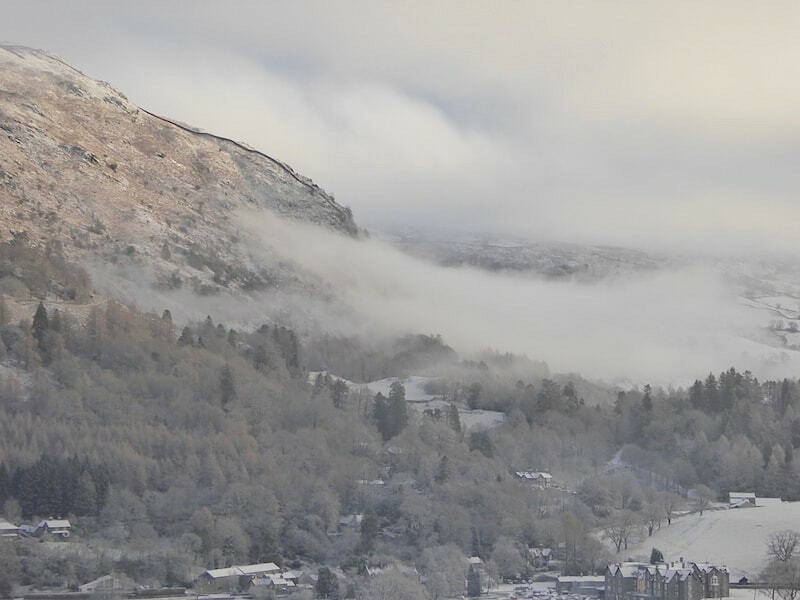 The fog creeps higher over Nab Scar, on the right, which still has some sunlight on it. 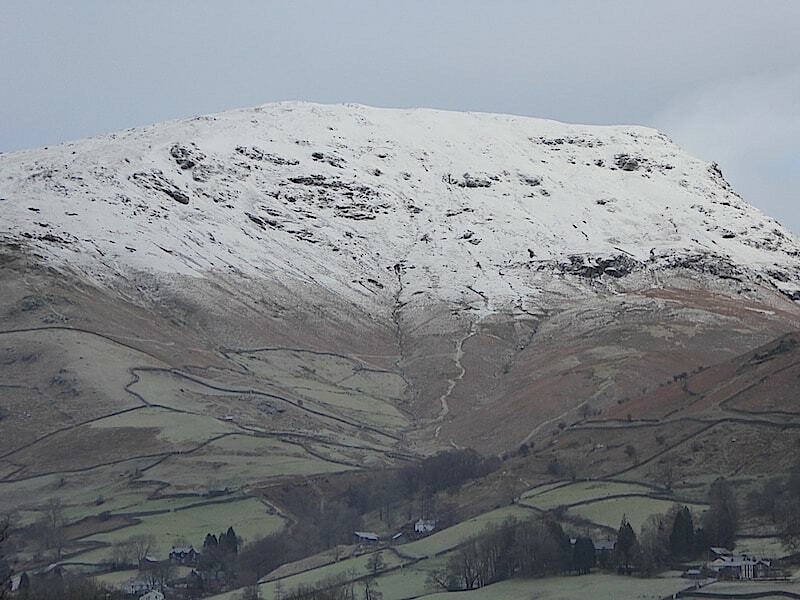 Heron Pike, on the left, is still free of cloud and there goes that patch of blue sky that we had a little earlier. 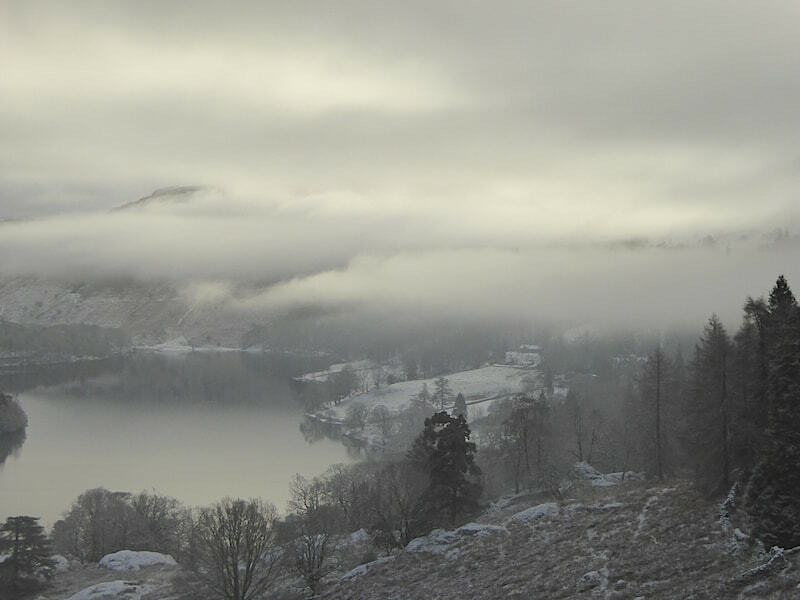 The fog thins a little and more of Loughrigg starts to appear. 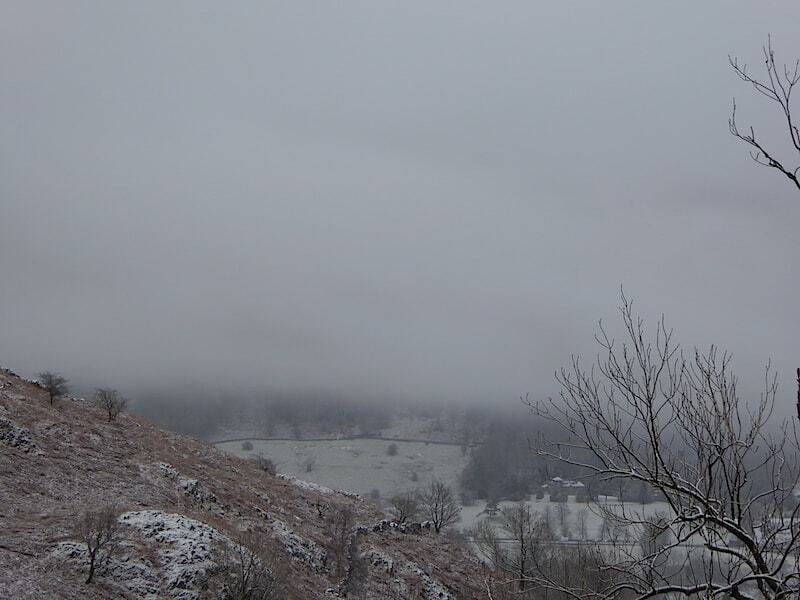 Nab Scar has lost the sunshine and the fog is creeping higher. 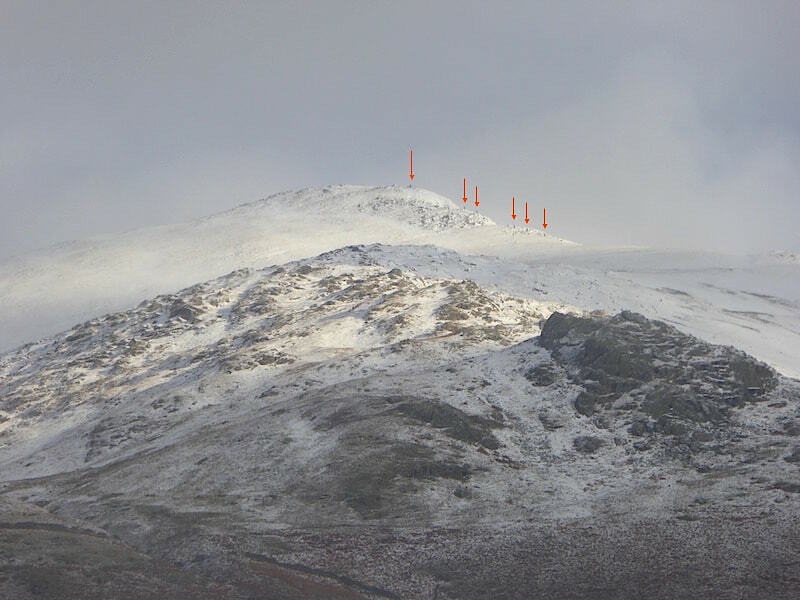 Heron Pike now has a fresh coating of snow. There are a couple of walkers up there over on the left, I bet they weren’t too thrilled when the snow storm reached them. 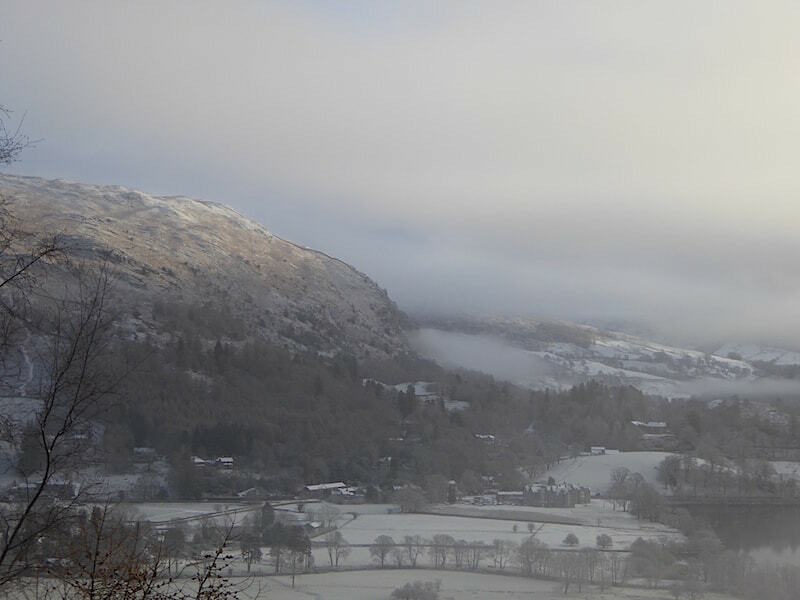 Now its Helm Crag’s turn to be bathed in sunshine. 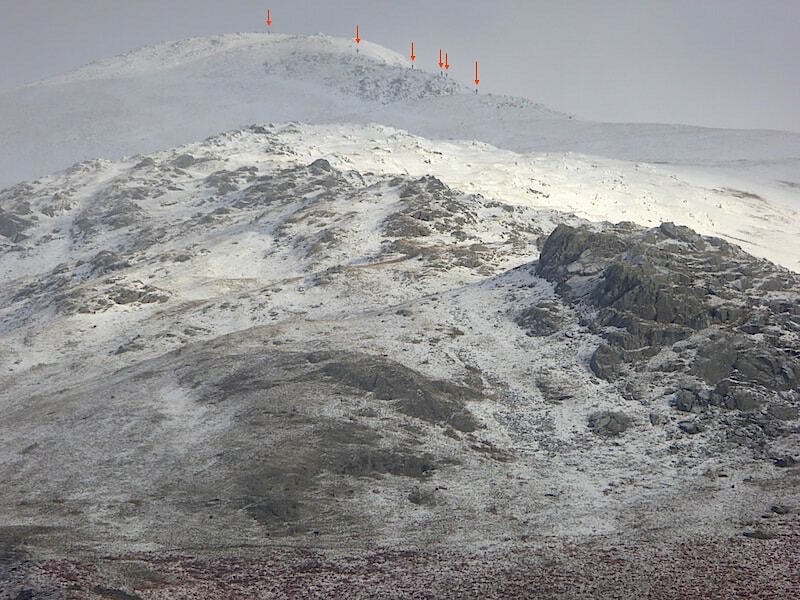 Great Rigg behind Stone Arthur, they both have a fresh covering of snow now. 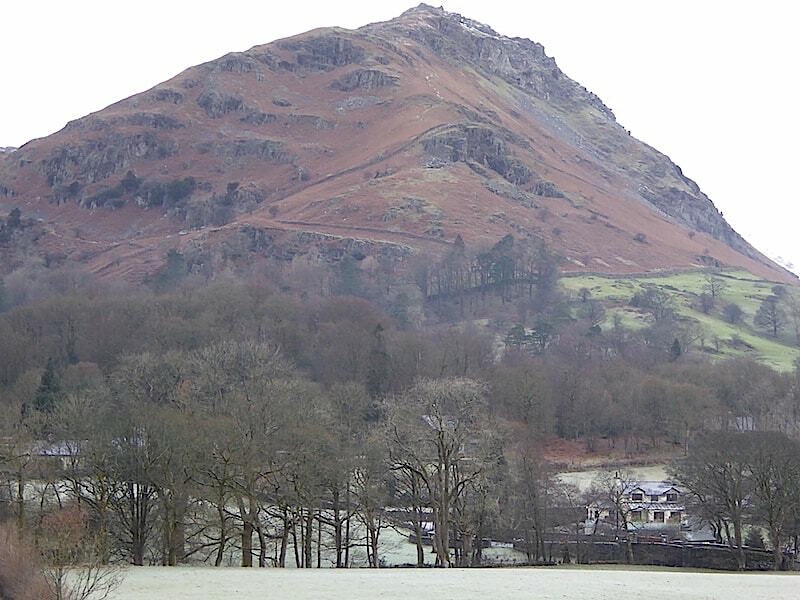 Great Rigg behind Stone Arthur. 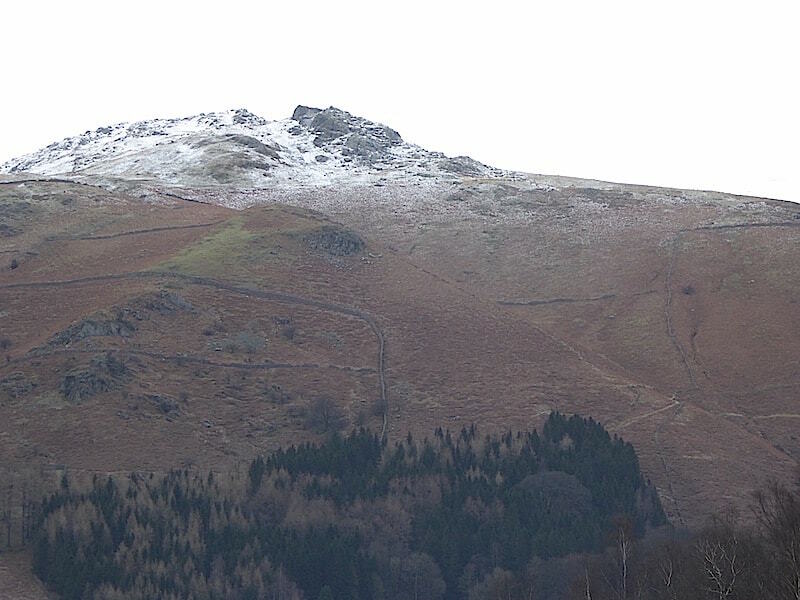 If you zoom in you can see six walkers heading for Great Rigg summit. 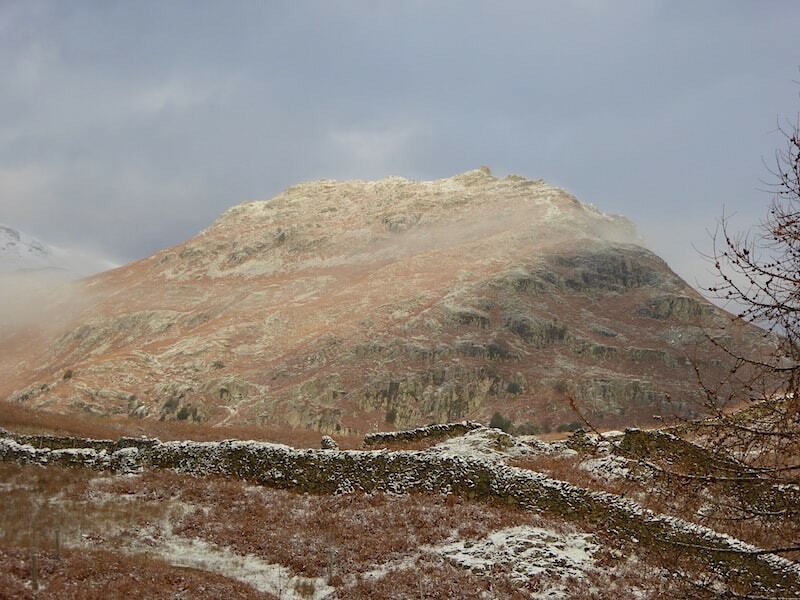 Great Rigg again. The walkers have progressed a little further along the path. 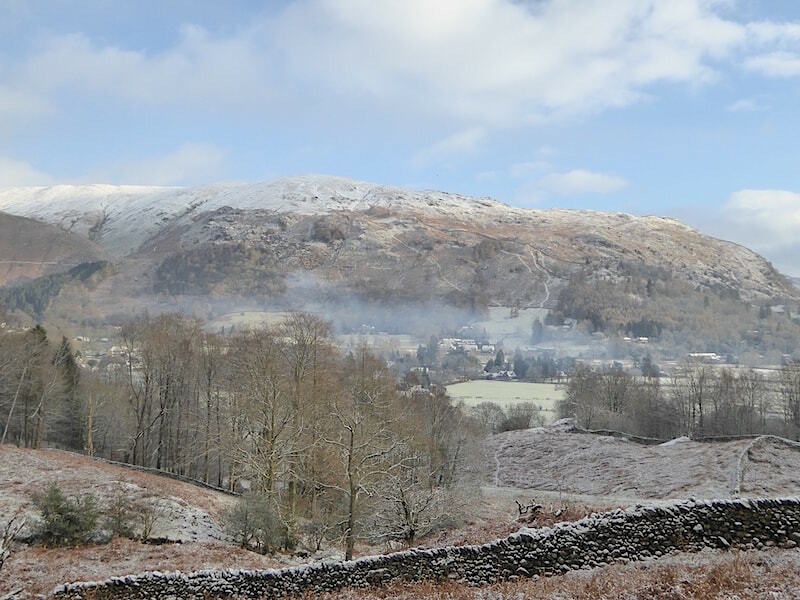 Blue skies now over Nab Scar and Heron Pike but it was a short lived break in the weather and as we walked back into Grasmere it started to hail, it continued to do so all the way back to the car. 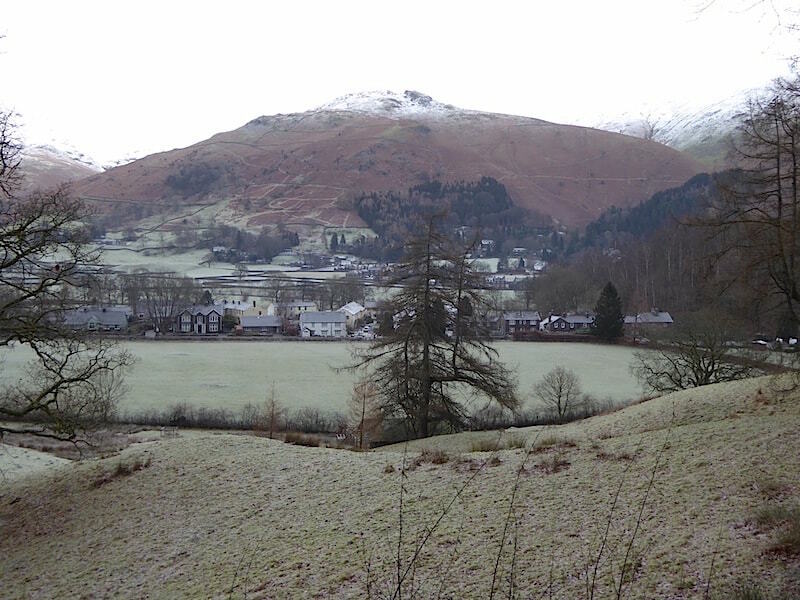 The hail wasn’t the only nuisance as the roads and pavements in Grasmere were still extremely icy and quite difficult to walk on. As we reached the car the hail turned to rain and it continued to fall all the way home. 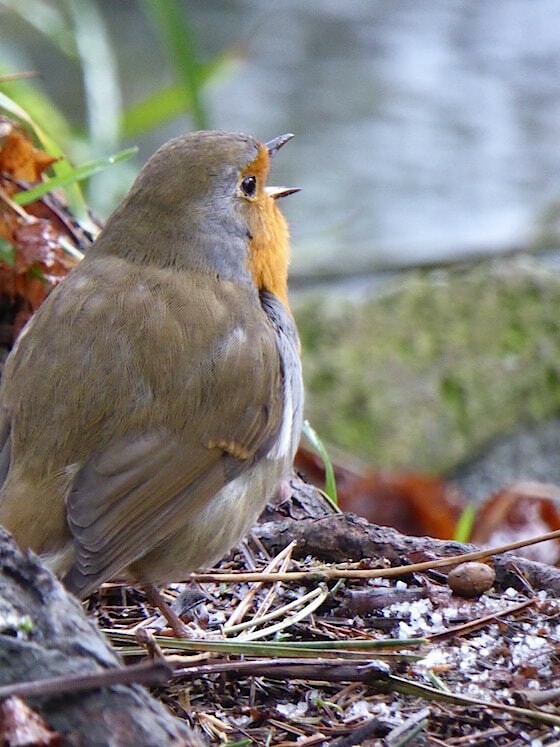 As we walked back to the car alongside the river this robin flew down in front of me and proceeded to enjoy some lunch, mmmmm nice. The worm was almost as long as it was. Just the last little bit to go. 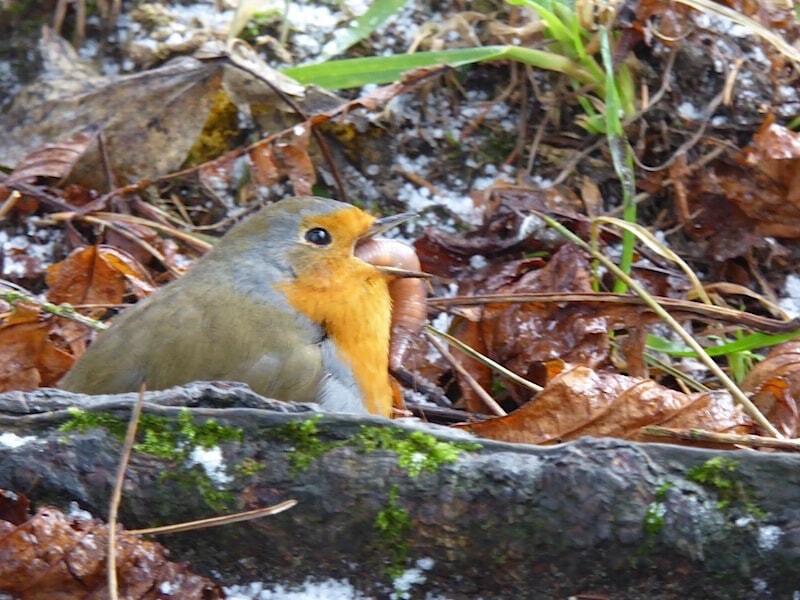 All gone, and judging by its size this robin has found a large number of those fat, juicy worms around here. I wonder if that nut is the dessert course? The Millenium Bridge in Grasmere as we return to the car in the rain. The cloud is really down now and it has turned into quite a miserable day, so it was probably wise to stop when we did. 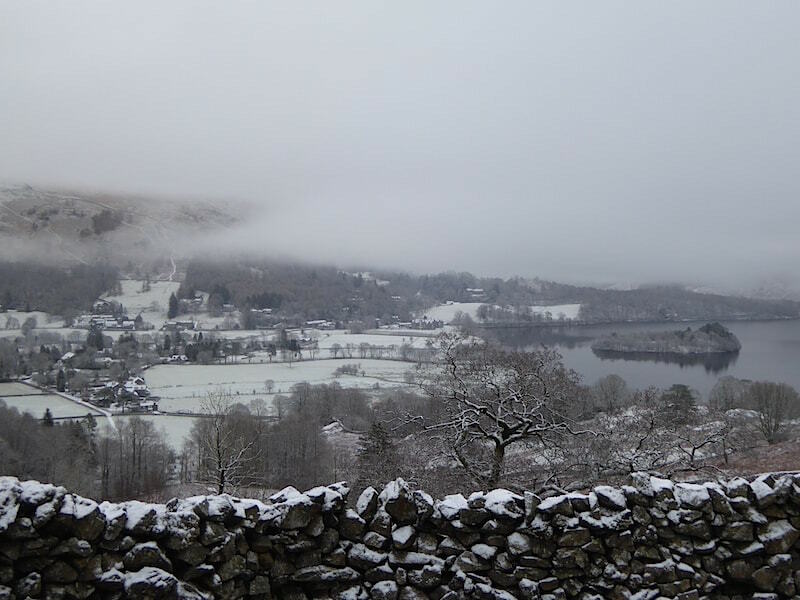 The weird atmospherics we witnessed around Grasmere were something we haven’t experienced before, so the change of plan turned out quite well in the end, and after all we can have a walk up Silver How any old time.